You will recognize workers as a person not only the name. You will see their strengths and weaknesses You will learn their potential and that they are your most important resource to the company. 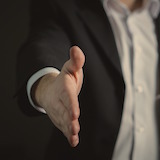 Every day in the office shake somebody’s hand, tell them they did a good job or that you are happy to work with them. People will feel more important and part of the company. Every day you go into the office, stop and spend one minute looking into the workers’ faces.